Convenient feeding management, and the aquatic feed can be suspended in the water surface for a long time. It is not required to set up the feeding table when feed fish, but a fixed point is necessary. Fishes need to float on the surface when they are eating, which can directly observe their situation, timely adjust of the feeding amount, and know the fish growth and health. Therefore, the expansion of aquatic feed is helpful to scientific feeding and management, not only saves a lot of time, but also can improve the labor productivity. Farmers can calculate feeding amount according to fish varieties, specifications, quantity, water temperature and feeding rate, then feed quickly, which can both save a lot of time, and improve labor productivity. There are many anti nutrition factors in feed materials, such as gossypol, saponin, trypsin inhibitor, which exist in oilseeds, soybean meal and cottonseed meal. At a certain moisture and temperature, these anti nutritional factors gradually lose some of the activity in the process of expanding, thus decrease the damage to digestive enzymes, improve the digestion and absorption rate of feed, reduce excretion. Through the expansion of equipment, material expand instantaneously at high temperature and pressure, to meet the requirements of floating. The high temperature, high humidity and high pressure can kill most of the harmful microorganisms. Data shows that there are 10,000 Escherichia coli per gram of raw material, but remain less than 10 Escherichia coli after expanding. Salmonella could be killed totally after expanding at the high temperature of 85℃, this helps keep water quality, reducing adverse environmental factors in aquaculture. At the same time, the feed water content is 8%-10%, which improved the storage stability of the aquatic feed. 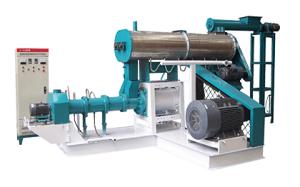 The temperature is 85-95℃ during processing sinking fish feed, while it is 120-145℃ during processing floating fish feed, the maximum temperature during extrusion and expansion is up to 150℃, raw material at high temperature is only work eight seconds. After the expansion at high temperature and pressure, a variety of microorganisms, eggs and pathogenic bacteria were killed, which improve the quality of feed, reduce the disease of animal digestive tract. At the same time floating fish feed can be improved feed palatability, absorption and utilization through high temperature curing. Floating fish feed has a good stability in the water, not dissolved within two hours, and floating time of high quality floating fish feed can be as long as 12 hours, which can avoid the nutritional ingredients loss in water or sink into the mud and waste. The floating fish feed will save 10% – 20% material than sinking fish feed, even if some of the feed left, can be picked up to dry, which can highly limit to control feed waste. Floating fish feed is easy to observe and control, this can reduce or avoid powder material, residual bait to pollute water, which are very favorable for environmental protection and the growth of fish. Due to high temperature, high pressure expansion, and drying treatment, water content is relatively low (usually around 9%), the particles are hard with high stability. Therefore, floating fish feed can be stored for a long time, and is not easy to damp, not prone to mildew, which can avoid loss of nutrients. Floating feeds has very strong water stability (wouldn’t apart within 16-32 hours), with little pollution on the water. Spongy, porous floating pellet feed for pelagic fish floats in the water, which is easy to observe the fish feeding and growth, conducive to scientific management. After extrusion, the structure of feed pellet is loose, porous, crispy, and with good taste and flavor. Templates can be made into different shapes of holes, so that different shapes can be suppressed. It also can be produced special high fat feed for such as the Atlantic salmon, rainbow trout and other aquaculture species, some fat content is as high as 30%. Research showed the α degree of α type starch increased from 13.58% to 81.55% in the feed after extrusion, the higher degree of swelling, the easier to be fully utilized by the enzyme. Through the high temperature and high pressure in the process of expanding, the plant material can make the starch pasting and protein organized, which is beneficial to the digestion and absorption of the animal, improving the digestibility and utilization of feed. The digestibility of aquatic feed can be increased 10%-35% by expanded processing. For example, digestion rate of rainbow trout is only 40% for raw starch, while for cooked starch is more than 60%. At present, most of the cultured fish such as carp, grass carp, crucian carp are no stomach fish, they mainly rely on intestinal absorption. So the smaller the feed, the higher the rate of absorption and utilization of fish. In the process of production, 95% of raw material crushing fineness of sea water fish and other high grade expanded aquatic products are over 80 mesh, even for common varieties such as grass carp, tilapia and catfish, 95% of expanded raw material crushing fineness are over 60 mesh. 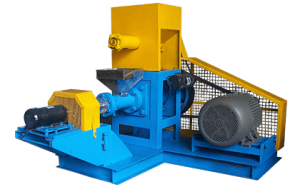 The highest utilization rate of floating material after super fine crushing can reach 98%, while the highest utilization rate of the sinking material is only 75%. The way of farming, floating fish feed has broad applicability, could be use for pond fish culture, paddy field fish culture, running water fish culture, cage fish culture, industrial fish farming, and fish farming in large area. Especially for smaller breeding density of fisheries, such as pond fish culture, paddy field fish culture, and fish farming in large area, using of floating fish feed is more superior than other feed. The species of fish, except for a few benthic fishes, regardless of freshwater fish, or marine fish can feed floating fish feed, such as basses, snakeheaded fishes, ornamental fishes, American frogs, turtles, punetaus. And common species such as grass carp, cyprinoid, crucian. For the more special physiological functions like basses and American frogs, using floating feed for aquaculture, it is more convenient, more able to show its superiority. 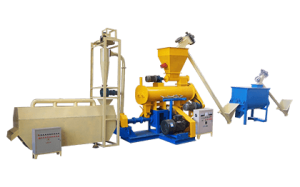 According to the different varieties and different growth stages, fish feed extruder machine can produce the floating fish feed which is suitable for its caliber and nutrition needs. It can meet the needs of conventional aquaculture and special aquaculture, not only to facilitate the cultivation of producers, but also to promote the development of production.